Bahrain Bay, the waterfront real estate development on the northern coastline of Manama has grown to become a familiar sight. The distinct modern buildings such as Four Seasons Hotel Bahrain Bay, Arcapita Bank global headquarters and the winding United Tower have made their mark on the capital’s skyline. Several new buildings are set to change the vista even further, with many beginning construction in 2016. 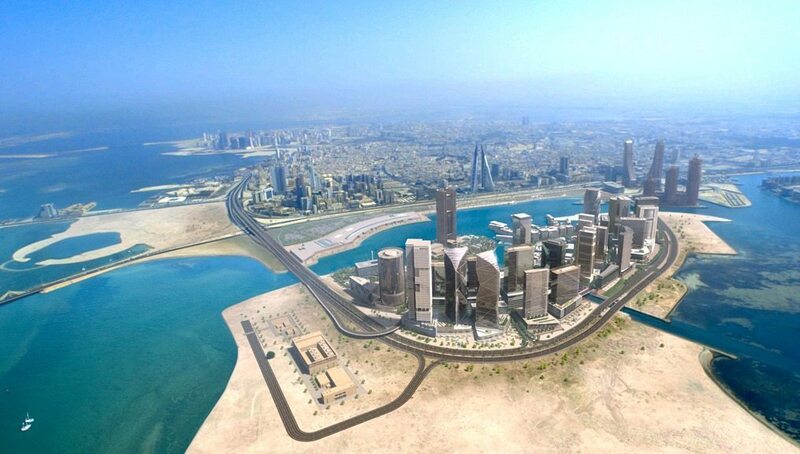 The $2.5 billion Bahrain Bay project was launched in 2006 and the efforts of the last 10 years are starting to show results. Many parts of the multiphase project have already been completed and a few remaining are due for completion within the next year. The mixed use development has been designed to include residential, commercial, retail, tourism, and community facilities and public amenities. As a whole the project is attracting a lot of interest from local and regional investors. The latest inauguration at Bahrain Bay was in March this year when Canadian luxury hotel operator Four Seasons opened the Four Seasons Hotel Bahrain Bay. The beginning of 2016 will see Al Baraka Banking Group, one of the world’s largest Islamic banking and financial services organizations, move into their building which will house the bank’s Middle East headquarters. One of the latest major investors, Bin Faqeeh Real Estate Investment Company, is developing Bahrain Bay’s first residential complex ‘Water Bay “. The project is being developed with fast-track approach, with preparatory ground works already under way. Basement construction will start by early 2016 and the first of the three 10-storey residential towers will be ready to welcome residents in early 2018. The eye-catching building, United Tower, by Cooperation Investment House, one of Bahrain’s most active integrated real estate developers, is expected to open in mid-2016. The winding 47-storey tower will house Wyndham Grand Manama; an international five star hotel by US headquartered Wyndham Hotel Group. The hotel will occupy 14 floors of the spiraling landmark, along with office space to be leased on the open market. Adding to the hospitality offering at Bahrain Bay will be Marriot, another international luxury hotel operator. A new design for the hotel is currently being finalised and construction is expected to start in mid-2016. AXA Group, a French multinational insurance firm and one of the world’s leading insurance and asset management groups, will be moving their regional office to Bahrain Bay in a newly constructed office building. Bay City, a development of almost 290,000sqm of residential, commercial and retail space on the waterfront overlooking Manama, is also scheduled for construction in 2016. Bay City will be constructed in phases, with the first phase set to start in Q3 2016. Another residential project, WAFRA, is planned on the plot east of United Tower. The twin towered WAFRA is currently in the early stages of design completion, leading to the start of construction in early 2016. “We are certain that the strategic partnerships Bahrain Bay has formed with the various local and international investors will deliver long-lasting results for all stakeholders. The ongoing progress strengthens Bahrain Bay’s position as a major investment hub, adding significant value to the community and the future of Bahrain as a whole,” concludes Mr. Suri.